I am not an “every kid gets a trophy” kind of person, but I believe very much in praising piano students so that they stay motivated. Not all praise is created equal, however. When it comes to young children, generic praise will go in one ear and out the other. Or, if kids do hear generic praise, they will pick it apart for its authenticity. They’ll know if your, “Really great lesson today!” was not an entirely accurate assessment of the lesson experience. The key, therefore, is to regularly give relevant, honest, and targeted praise in the form of a written student assessment. Whether your piano student is rocking lessons or stuck in a rut, there is always an opportunity for relevant and targeted praise. And when you put it in writing it’s all the more meaningful. 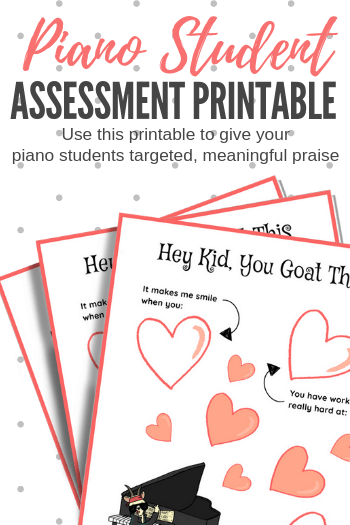 In today’s post we’re sharing a printable that you can quickly complete at the end of a piano lesson so that your student goes home with relevant, honest and targeted praise. I am a huge proponent of putting praise in writing. Written praise carries more significance and lasts as long as the paper it’s written on. It also gives parents the opportunity to piggyback on your praise and compound on its effects. Of course, as mentioned earlier, praise means nothing unless its relevant, honest, and targeted. 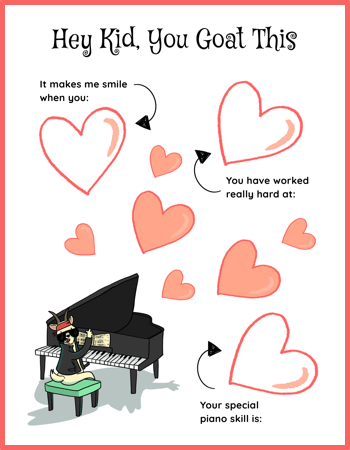 So, as you complete the printable below for a piano student, be as specific as possible when selecting the effort or skills you are going to praise. If you tell a student that she played “really well”, the praise will have little affect on future piano performances. But if you tell a student that her staccato notes in measure four were perfectly crisp, then you can bet that her staccato notes in every piece she ever plays will be perfectly crisp too! 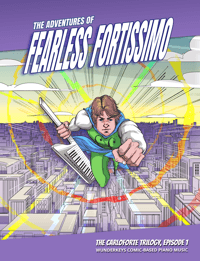 Below we have included two printables for piano praise. One is fairly generic and the second is a bit more fun for your kids who love a good giggle. Each printable has three hearts where you can write your relevant, honest and targeted praise. can’t wait to show me the piece you practiced at home. give me high-fives after we play a piano game. play Saorla’s theme with so much heartfelt expression. keeping your tempo steady when you play Sneaky Sloth. overcoming your fear of performing in front of large groups. learning to read ledger lines. 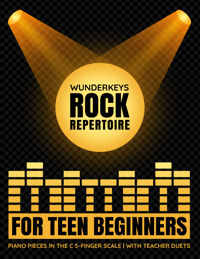 your ability to tell a story when playing music in minor keys. 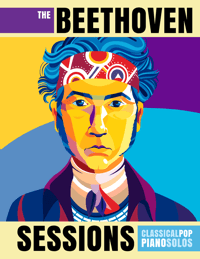 your attention to crescendo and diminuendo when you play. 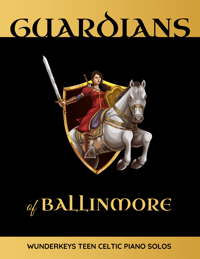 your confidence in working ahead in your book at home. What Is Even More Motivating Than Praise? 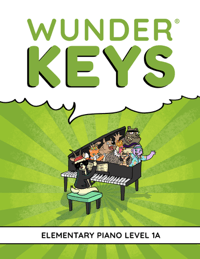 You will never again have to worry about keeping piano students motivated when you use our newest piano method book, WunderKeys Elementary Piano Level 1A. 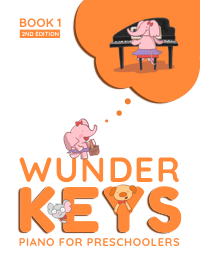 If your kids have completed a primer series and are ready for a Level 1 book that will turn them into lifelong students who LOVE the piano, continue their journey with WunderKeys Level 1A. 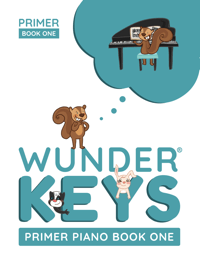 Check out WunderKeys Elementary Piano Level 1A here on Amazon.